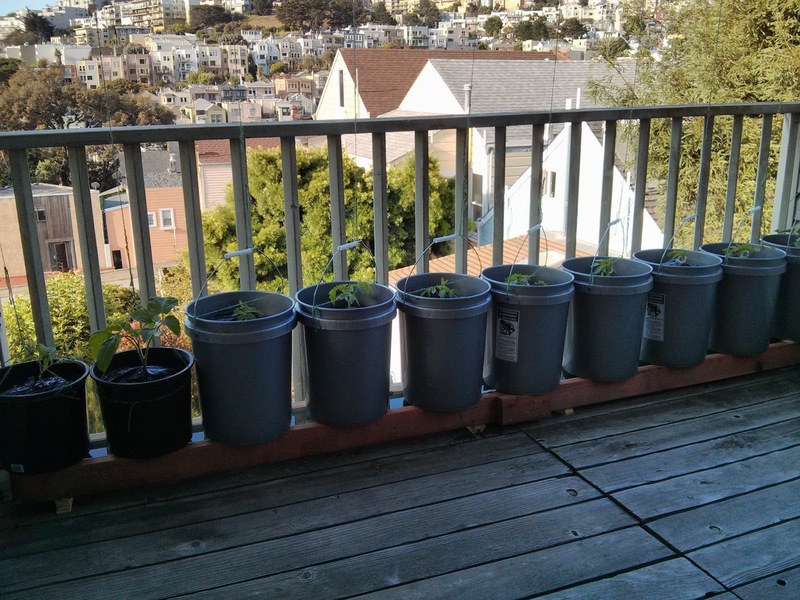 For 2013 I decided to start gardening on my San Francisco patio. Some newer techniques like the RGGS (Rain Gutter Gardening System) which allows plants in buckets to be self watered via a rain gutter made it easy to get up and going with little effort and maintenance. It consists of two 2x4x10’s, one 10ft pvc gutter, two end caps, one float to regulate water, buckets for the plants, and 3″ hydroponic cups to dip into the water from the bottom of the bucket. I also covered the top of the soil with a plastic barrier to keep the wind from drying out the top 2″ of soil. I chose cold tolerant varieties from tomatofest.com such as Alaska, Stupice, Ispolin, Gigantesque, Carmello, Black Prince, Beaverlodge Slicer, Azoychka, San Francisco Fog, Bloody Butcher, Svetlana Red. Their origins range from all over the cold nether regions of the Northern Hemisphere, so at least one is going to be great for growing here, right? I tried this once before with just Alaska & Stupice in 3 gallon pots I had to water by hand, and they were a big fail, resulting in long spindly things who only wished to be put out of their misery. Alaska is doing much better this time around, it is growing indoors since it is a determinate variety. I started the seeds with some mycorrhiza fungus to help speed the nutrient uptake from early on. I subjected the seedlings to wind from fans and open windows to get them to grow stronger and more compact. From the pellets I planted them in 3″ compostable pots, burying a part of the stem when they were big enough, and from there planted them in their final buckets ($1.87 each from Lowes, score) burying part of the new stem as well. It has now been 2 months since I planted the seeds, and some varieties are doing better than others. It seems like there are only 3 outdoors that are really doing well right now, and if they really do well, then I will take a sucker, and root it to propagate the plant into a bucket where a plant failed. Most have been outside for 2-3 weeks, and instead of just growing, the wind has kept them a compact size, the stems have grown to be up to 3/4″ thick and very sturdy. The vast majority seem to be healthy and have started growing flowers. I’m keeping notes on all the plants, and will dedicate a blog post to each one when I get enough data together for them. Listed at the bottom of this post are links to the supplies I used to build my RGGS. The only things you can’t get off Amazon are the 2x4x10′ (qty 2), 10′ rain gutter, rain gutter end caps (qty 2), buckets, and potting soil. For a more visual walk-through of building one of these, check YouTube. You begin by drilling a hole for the float in one end cap, and anchoring the float inside. You then assemble the end caps (if the end caps don’t have a seal and snap together, glue them with pvc primer & cement). After that is dried, predrill holes for the roof screws through the rain gutter every 8″ on each side, with the hole approximately 3/8″ from the top of the rain gutter. Then attach a 2×4 to each side of the rain gutter with the roofing screws, lining the top of the rain gutter with the top of the wood. The rain gutter is not as tall as the wood, and will hang from the wood. Wrap the plumbers tape smoothly in a clockwise direction around the threaded side of the float on the outside of the rain gutter end cap. Wrap the tape tightly around about ten times, otherwise you risk a dripping leak. Screw the swivel hose connector onto the float until water tight. Attach the other end to a hose. Turn the water on and adjust the float so the water stops at screw level. Use the shims to adjust the RGGS so the water is level, and include shims every 2.5′ for even support. The timer and Y connector are optional. The timer lets you have a bit more peace of mind that in case of a failure of the float, water won’t be flowing 24×7. I set mine to 3 minutes every 2 hours.